I took a hard cover book apart, removing the block of text paper. 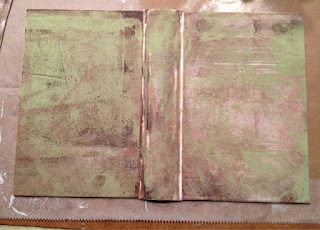 The book cover was an orange color so I covered it with white Gesso so that the color would be mostly hidden, and yet I wanted the texture to remain.The lettering on the spine and cover was impressed into the book so it gave an additional texture although you can no longer read it. 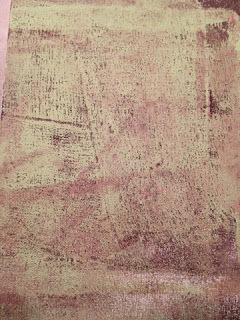 Using yellow, greens and browns (separate layers), I got the following results with the Gelli Arts™ Gel Printing Plate and am letting it sit until I decided what to do next. I also printed some textured paper with the same colors. I LOVE the weathered look......like an old house's porch or the wood on an old screen door at my great aunt's house. 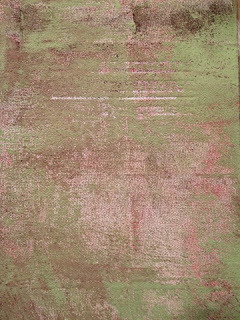 One of my favorite techniques is to pounce the brayer, varying the angle, on the Gelli Arts™ Plate so that I get marks, and sometimes the paint lifts into a little textured peak. The white lines on the cover spine are where the paint didn't reach....I am mulling over some ideas about coloring the white lines. 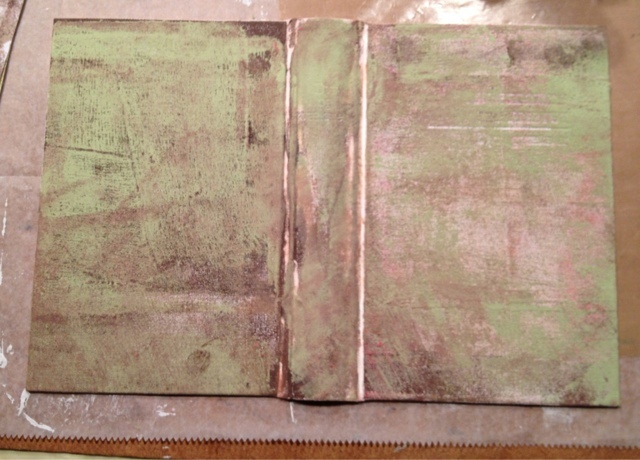 This project will probably become a new book with pages I've made from the Gelli Arts™Plate. Hope your week is going well - it's COLD here in Michigan!